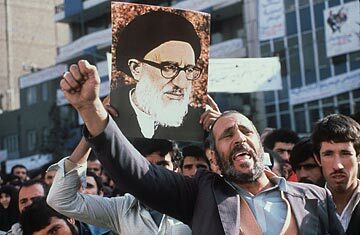 An Anti-American crowd demonstrates outside of the U.S. Embassy in Tehran, Iran on November 21, 1979. Ever since the crowds flooded into Tahrir Square, I've begun talking to the living-room television. "Drop that hand!" I shouted at the raised fist of a pro-Mubarak thug a few days ago. On Friday, watching the fireworks over the skies of Cairo, I enviously mumbled: "How come we didn't do that?" We, as in the young Iranians who flooded Tehran's own equivalent of Liberation Square, Azadi, on the same exact day 32 years ago. I was 12 at the time, but the events of that year remain my existential paradox, my life's most cherished trauma. The pundits now breezily call Iran's 1979 revolution "Islamic." But at the time, religious and secular, villagers and urbanites, educated and illiterate, all equally angrily, were marching in the streets and demanding the removal of the Shah. Iran's future was as unknowable then as Egypt's future is now. Comparisons between Iran and Egypt abound and the guessing goes on as to what number Egypt's needle truly points on the Iranian time scale: 1979, or 2009  the year the Green movement took the streets of Tehran. One of the dozen exuberant wallposts on my facebook page on Friday reads: "Egypt did it in 18 days. Iran will do it in a week!" Egypt is not Iran. No two histories or nations, no matter how much they have in common, are interchangeable. But movements striving for common democratic goals have consistently exchanged the lessons of their struggles to inform and warn their comrades elsewhere against the pitfalls and to also facilitate a change of their own. The fear that fleeing dictators exude is very potent. Today's Egyptian democratic forces ought to heed the errors of their Iranian counterparts from 1979. Above all because those errors were, by and large, not rooted in malice or ignorance but in good intentions. And also because their sinister effects did not reveal themselves until long after the euphoria had ebbed and the crowds had left the squares to resume their lives once again. The first misstep of the Iranian secular movement came as early as 1978, when they blindly embraced a union with the religious opposition, having been perfectly disarmed by them. When the exiled Ayatollah Khomeini said that he had no political ambitions, and that, once the Shah was gone, his only wish was to hunker down with a Koran at a seminary in Qom, everyone believed him. When he spoke against the violations of human rights in the Shah's prisons, the intellectuals called him their homegrown Gandhi. When he talked of gender equality and women's rights, he was hailed unequivocally as if he'd been the heir to Betty Friedan. Before rising to power, the religious opposition to the Shah, headed by the Ayatollah, told Iranians what they wished to hear and they believed everything they heard. The few who were smart enough not to believe the Ayatollah made the common mistake smart people often make: they underestimated the intelligence of others. They were confident that they could outmaneuver the Ayatollah. The Western-educated, stylishly-suited secular leaders assumed themselves far too sophisticated to be outwitted by the plainly-dressed provincial clerics. See photos of the rise and fall of Iran's shah.